This week has been busy - I gave exams in both of the my classes. I get more nervous about giving exams than I ever did about taking them. But they both went well. Preparing for them and grading them has taken up all of my energy and time this week. I did start a new knitting project, despite not having finished any of the old one's. 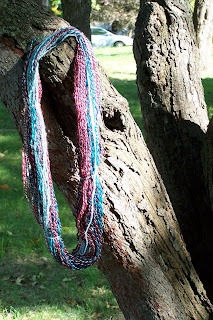 It is a simple mistake-rib scarf, but it is knit in some of my own handspun yarn. I had been hankering to knit with this handspun, so I finally gave in. The simple knitting is just what I needed for this week. I am really liking it. Pictures will be taken this weekend. Also, stay tuned for updates on the works in progress - including two that I have not mentioned here before. In the meantime, a picture of some of my handspun yarn I created last year after getting my spinning wheel.